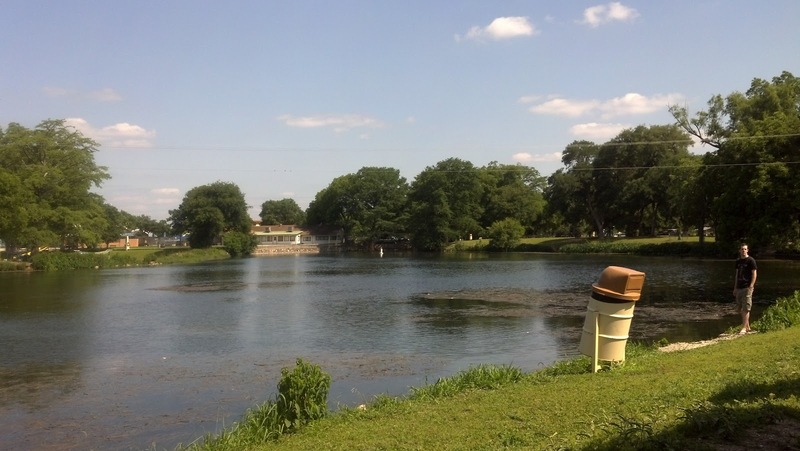 I had the opportunity to get my son early from daycare one day, and I decided to take him to Landa Park in New Braunfels. Because they have a train! OMG! You are saying right now. 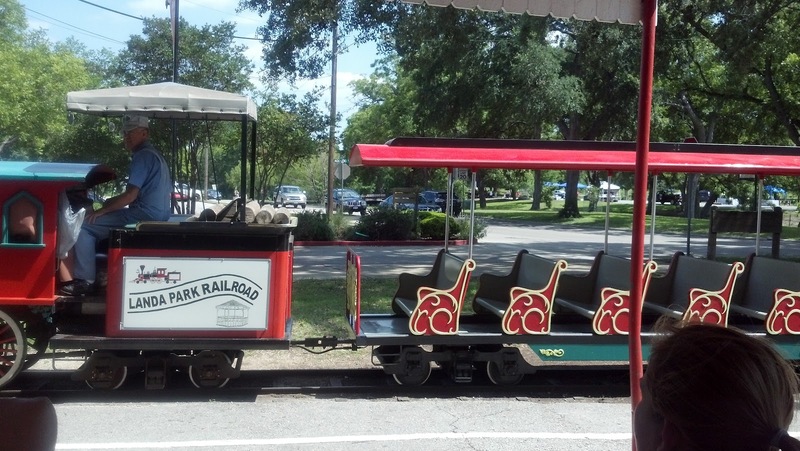 Do you mean to tell me that there's an actual park with a TRAIN?!!! What a novel idea! We need one of those in our city right now! Too snarky? I've blogged before about how much Zane loves trains, so that's old news. I thought that he might like a train ride around the park, at least. Also, I wanted to ride the train, too, just to say that I did. You have to have a child to ride the train, otherwise you look like a creepy sort. After we paid the money for our tickets, Zane and I chose our seats. Seats that were designed for children, not adults. I had a little trouble getting on the train; I stepped up and nearly slammed my head into the pretty red roof. When I sat down, my knees were bent up so far underneath my breasts that I felt as though they were next to my ears. I am not a tall person, but I certainly felt giant-sized! We moved to the front of the car, where there was a little leg room. If I turned a little to the side, I had my knees touching the floor of the train, but that was better than having my breasts as ear muffs. We were on board, but there was no conductor. He went on a banana break. Zane was not happy. He wanted to go and get the conductor, just so we could be on our way. I looked at my knees; there was no way I could quickly get out of the position that I was in without mishap. I did what any mother would do, under the circumstances. I bribed him. Finally, the conductor finished his banana and started the engine. We were off! Look, Ma! It's a trash can! The ride was pleasant; it wasn't too hot that day, and a little breeze was blowing. 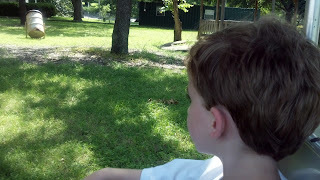 We passed through the golf course, went by the pool, and circled the playground. Zane waved at anyone and anything that we passed; most of the people waved back, including a police officer. The conductor rang the bell, and we watched a squirrel racing for the train. It was almost as if he wanted to catch a ride! I did not want Zane to see a squirrel get mashed to bits by a children's train, but Squirrelly(all squirrels are named Squirrelly, Zane decreed) stopped right next to the tracks because he found an acorn there. I was relieved, until the conductor rang the bell again, and another squirrel came racing. This happened several times before I realized that the conductor was ringing the bell and then throwing an acorn next to the train. The squirrels had been taught to come running for food. I thought that was sweet, and Zane loved seeing the squirrels race up to the train. I wondered, however, about the process of teaching the squirrels, and whether there were some squishings before they figured out what to do. That trash can followed us! Toward the end of the ride, we saw ducks and geese, people fishing; the usual things that one sees in a park. Zane immediately wanted to go on the ride again, but my feet were asleep and I knew that it would take me several minutes to unfold myself from the seat. I hoped that I would not require assistance from anyone to get out of the car. That would have been embarrassing. Fortunately, I was able to exit the vehicle without incident, and Zane and I made our way back to the car. I had to ice my knees later that evening, but since Zane had fun, it was all good. I wondered, however, about the process of teaching the squirrels, and whether there were some squishings before they figured out what to do. WAY too funny. And likely true. :) I love trains as well... even got married on one.